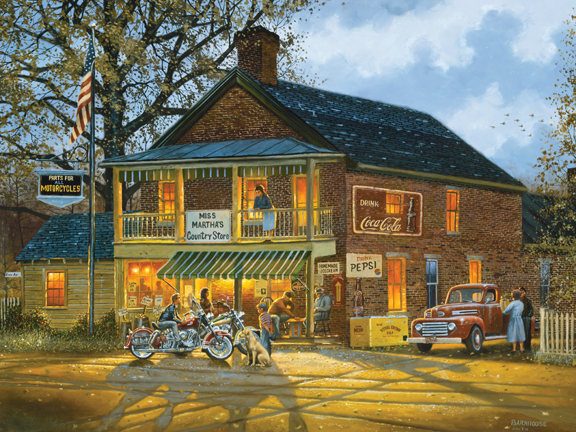 Artist Dave Barnhouse has never forgotten the values learned in his youth. He is a self-described “country-boy” who grew up in small-town Richmond, Ohio. “I want my art to make people feel as though they were back home on a Friday evening experiencing the warmth of a cozy fire and smelling the homemade bread and cookies coming from the oven.” Dave’s paintings are snapshots of life the way he remembers it from the 1950s and 60s. This entry was posted in Inspiration, Uncategorized and tagged Art, General Store, Inspiration, Nostalgia, Our Country, Our USA by Cher Valentino. Bookmark the permalink.